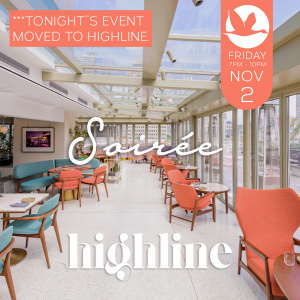 Join us for a fabulous Soirée event at Donghu Lu’s hottest rooftop lounge, Beverly. Located above the iconic club Le Baron and created by the same group behind Highline, The Nest, and Cannery. Ticket includes one welcome drink (wine, beer, mixed, or standard cocktail). The very retro chic design includes tulip bucket chairs, deep pink geometric carpeting, and soft blush lighting offset by greenery and emerald marble tables. It’s a more mature, albeit stylish and jaunty, hang-out where you can chat before hitting the LIT-ness downstairs. The music is solidly funk, soul and girl-power bands like ESG and The Slits.